Beautifully made and exquisitely presented, the Cabriole is the cigarette holder most often chosen by in-store customers as a gift. 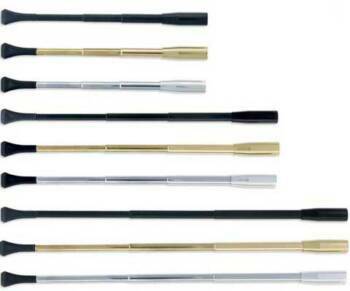 These oh-so-elegant long cigarette holders are instantly recognizable as the standard for traditional formality - in either Opera, Theatre, or Dinner length - they are quite utterly fabulous. Note: "Slimline" refers to the feel-in-the-hand of the barrel of these holders, and not to the diameter of the cigarette. For a lengthy alternative that does accept slim diameters, please see the Cabriole, on this page as well as the Slim Cigarette Holders page. A cigarette is the perfect type of a perfect pleasure. It is exquisite, and it leaves one unsatisfied. What more can one want? 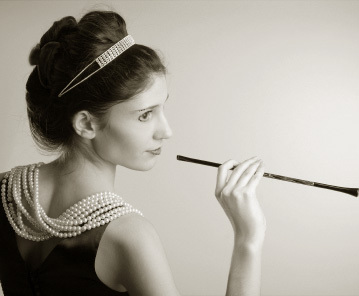 For decades, cigarette holders have been the signature accessory for the lady who smokes. 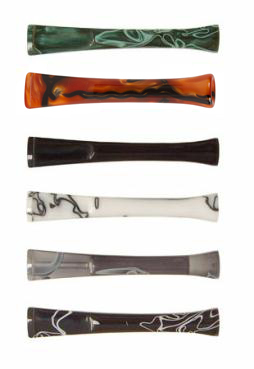 there is a perfect cigarette holder for your unique signature. Shop securely online or by telephone - orders placed online usually ship the same day. This charmingly flirtatious flibbertigibbet craves attention - and gets it. Capturing both vintage style and function, the draw is light, the look is sassy. Strikingly sophisticated, these contemporary Italian Lucite cigarette holders define modern elegance with a flair for the dramatic. (The broad continental grip is a customer favorite.) $39.99 .